IBM wanted to put a magical spin on their Internal 2018 Team Conference. They wanted to provide a day of learning, fun team building activities and a distinctive meeting place to host their conference, guest speaker presentations, and internal awards. In addition, they also desired a spacious, easy to get too venue that could accommodate 300 working professionals providing them with a tasty lunch and evening meal. 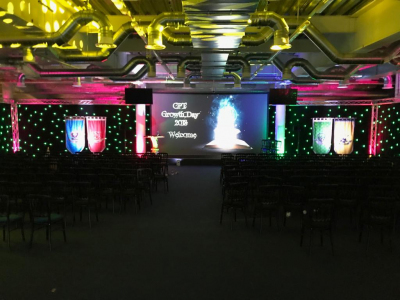 With our client’s vision in mind our team provided a fully themed wizard event hosted in the sophisticated Kia Oval, situated in the heart of London. Separated across two incredible suites and an outside roof top area with breath-taking views, the venue perfectly accommodated the 300 delegates with room to spare. Our team put together a full day of Wizardry that included a Magical teambuilding event, wizard theming complete with large props including house banners, a unique Wizard Conference set and room with all lighting and audio visual. One room was also transformed into the Great Hall where the delegates had chance to have lunch like real wizards, with candle light, pumpkin heads and the classical long dining tables. The morning started with our Wizard teambuilding event that saw the 300 delegates separated into 32 teams for them to prepare to enter the Tri wizard Tournament. All teams had to complete a variety of crystal maze games, including physical, mental and skill challenges to earn magical crystals. The top 4 teams with the most crystals then went to the Tri wizard tournament final to compete for the Tri wizard cup. 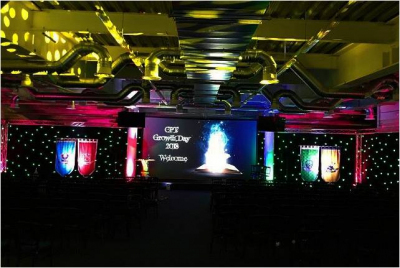 After lunch the main suite room was transformed into a Wizard dome ready for a selection of breakout sessions, a guest speaker and concluded with a selection of internal magical awards. As the day moved into the evening our team arranged for some exciting activities to take place, including our fantastic Magical Shy and Hoopla games. The 300 working professionals also had chance to take in the beautiful central city view from the Oval roof terrace and enjoy a sizzling BBQ. Overall the event was a fantastic success with our client noting that we really did magically deliver them a wonderful event.